Someone in one of the makeup groups I'm in, posted that The Shopping Channel was having a great deal on this bundled package of It Cosmetics products. It contained a 4 piece collection, of customers favourites. 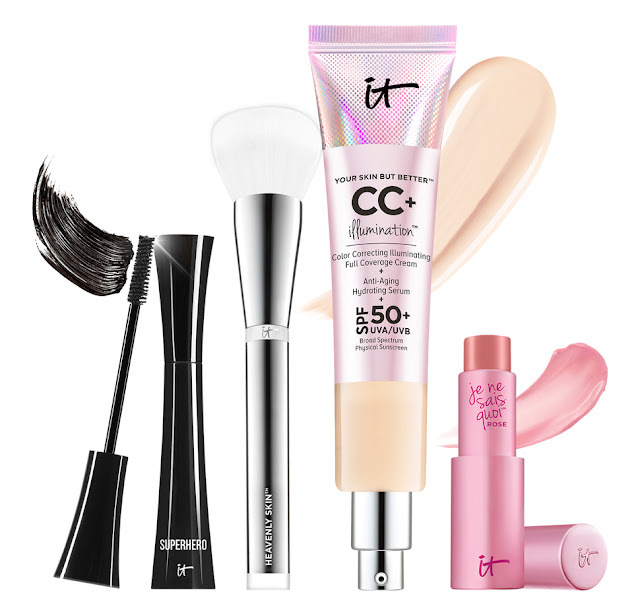 I haven't tried much from them, but I've heard amazing things about the original CC Cream, so I decided to take the plunge and ordered this set. As you can see, included in this 4 piece set was: Supersize CC+ Cream Illumination, Heavenly Skin CC+ Skin Perfecting Brush, Superhero Elastic Stretch Volumizing Mascara, Je Ne Sais Quoi Hydrating Colour Awakening Lip Treatment. These are all full size products, and the CC+ Cream is actually supersized, which means its larger than the original size. 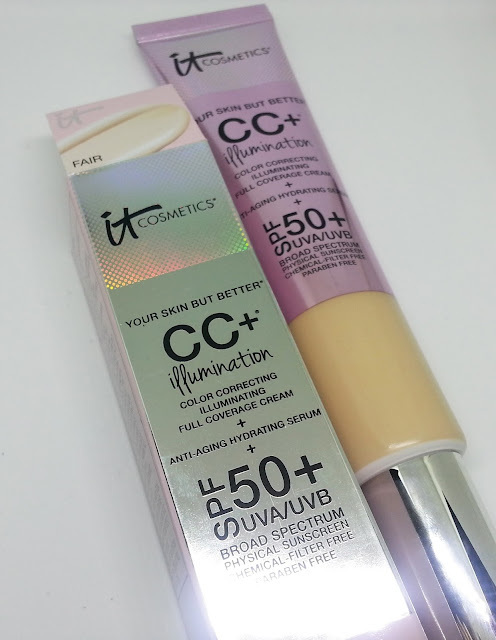 It all begins with the Supersize CC+™ Cream Illumination! This is the only time in 2017 that you can get the supersize version of your IT Girl Favorite! It's your complete skin care, your SPF 50 UVA/UVB physical-only sunscreen and full coverage in one step! There is no shimmer or glitter, but just a true, lit-from-within glow! Hydrolyzed collagen, peptides, niacin and hyaluronic acid help treat your skin while Drops of Light Technology™ helps give your skin a beautiful radiance. You can see how the foundation is somewhat dewy. It does blend out nicely, but it is a tinge too yellow. The Heavenly Skin™ CC+™ Skin Perfecting Brush pairs perfectly with CC+ Cream Illumination. It's never been easier to treat, protect and perfect your skin! This mascara stretches every lash longer and wider, giving you super-length, super-volume and helps transform your lashes in just one coat! 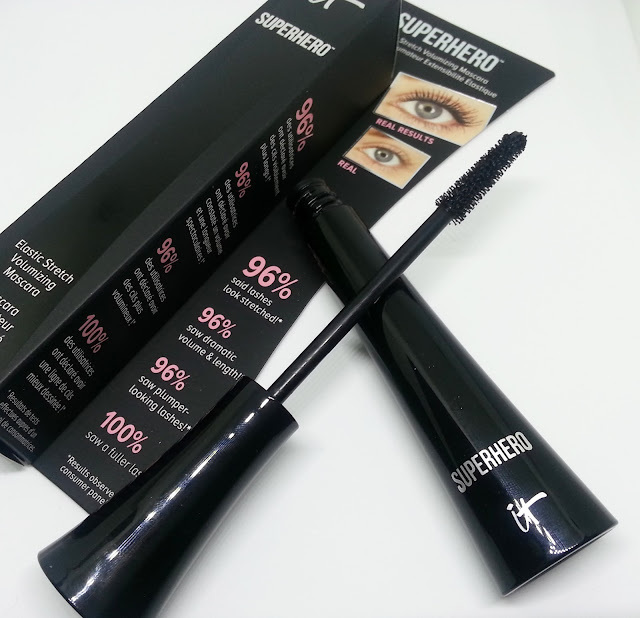 This award-winning mascara is formulated with peptides, proteins, biotin, lash-enhancing polymers, and collagen. The Lash-Enhancing Power Brush is custom-cut to coat every lash, at every length; no lash is left behind! This is your true lip therapy, delivering hydration and colour. The peptide-infused, lip-smoothing formula is made with essential butters and oils, hyaluronic filling spheres and antioxidants. And with the launch of the new shade, Rose, you'll get the perfect flush of rosy pink for the look of your lips—but better! The overall value (purchased separately) is $228.00 which is quite a lot! But this set was actually on sale for only $74.96. That's less than the supersized CC+ Cream on its own. Plus you can pay in equal payments if you don't want to pay for the full amount upfront, and eBates was 3% cash back, instead of the normal 1.5%. As soon as I received it in the mail (I ordered on a Friday night and it arrived Tuesday afternoon) and this post is based on my first impressions - since I had to apply it to my face asap. I will say I didn't use the brush to apply the CC Cream, just incase I didn't like it. There is a 30 day return policy through The Shopping Channel.. so I figured if the shade didn't match, or I just didn't like it, I will return it and the brush will be unused. Anyway! Here's how it all looked on me! It might look a little strange because I only applied mascara to one eye, so you guys could see how it looks compared to my normal lashes. I also didn't use any other products on my face. 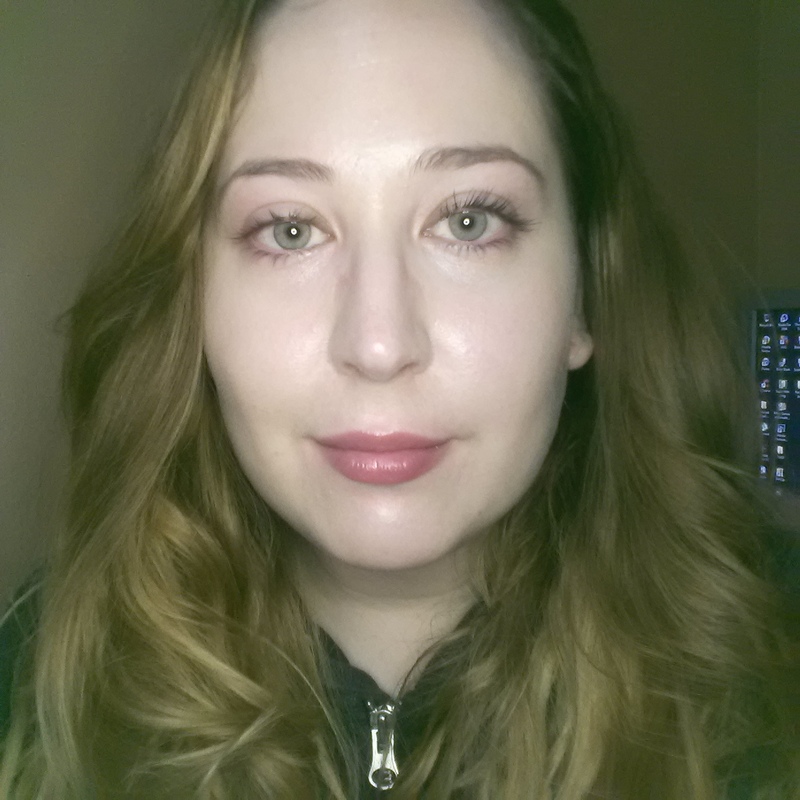 I applied a serum, and a booster before I applied the CC+ Cream. I debated putting a primer on, but I decided against it, because I wanted to see how this looked pretty much on its own. I also didn't use a concealer either, which I normally would under my eyes. Looking at it in this photo, you wouldn't know that it's slightly too yellow for me. But in the swatch you can tell it looks yellow - although it's supposed to be for cool-to-pink undertones. It did do a nice job even-ing out my skintone, and the only issue I had with it was it looked a little tiny bit dry/patchy just above my mouth - but I've recently have been having issues with that spot. I think a product may have upset my skin a little... but it isn't anything too noticeable with this foundation. I will also say that although it's not noticeable in the photo - it's very sparkly up close. From far away, it gives your face a pretty highlight, and surprisingly doesn't make it look greasy. But staring up close at my face, I can see silver sparkles. So if you don't like that, you definitely won't like this CC Cream. The mascara was a surprise for me. I've said plenty of times I prefer a mascara that will volumize vs lengthen my lashes... and this is more of a lengthener. BUT... I really like it! The brush made it super easy to apply, and you can see your lashes immediately look longer. I didn't have any issues with it smudging either. The lip treatment reminded me a little of the Fresh lip treatments. 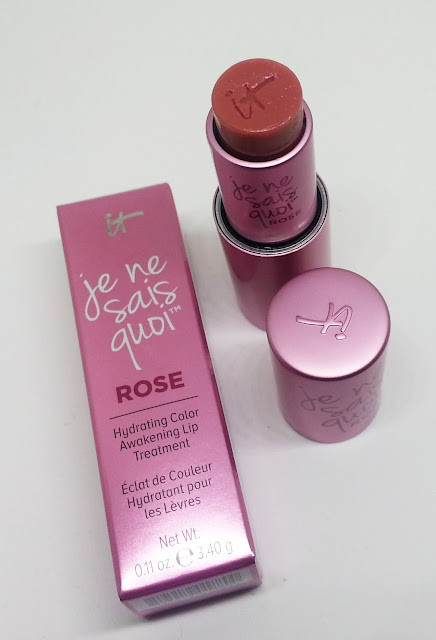 It doesn't provide a lot of colour to your lips, but it's a nice touch, and does add a little hydration to your lips. Overall, I am happy with this purchase. I will play around with the CC Cream by adding lightening drops to see if it knocks down the yellow a little... and I will try applying with the skin perfecting brush, instead of the beauty blender, to see how it does on my skin. But it didn't emphasize dry patches, and it definitely gives a pretty natural look to the skin (minus the sparkle lol). 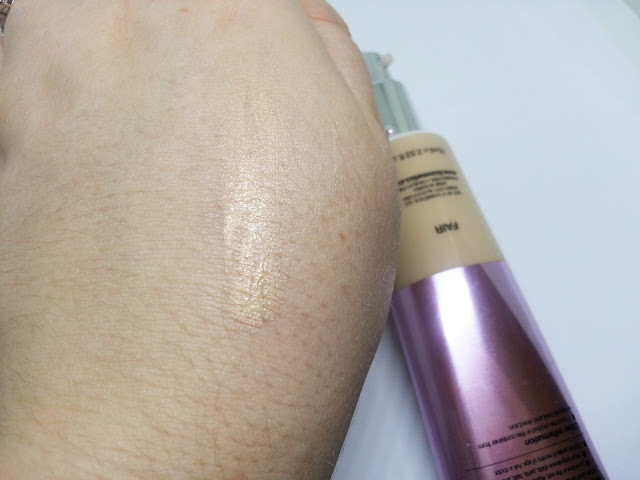 It kind of reminds me of the old Supermoisture makeup I used to love from Clinique (discontinued) - if it had a tad less silver sparkle, and the colour was actually fair... this CC Cream would be 5 stars in my book.